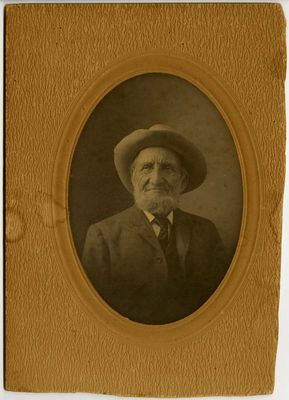 A black and white portrait with handwriting on the back that reads, "Solon Chase, The Sage of Chase's Mills, Turner, Me., A Greenbacker in the '80s and loved by all his friends and neighbors." Also written on the photograph is a name that appears to read Cora Chase Irish. Solon Chase, 1822-1909, was a Maine state legislator and postmaster.